I feel so fancy having a great backdrop and a real camera to capture outfits! Turns out it pays to go on vacation with people who will take outfit photos. This isn’t our family farm, but this corn crib is similar to one that my uncle & aunt disassembled last year. The 100+ year old aged pine was turned into a beautiful table where lots of us can eat and several other cherished furniture projects. This is the most comfortable dress I own – so soft, so practical (I can sit cross-legged, and it has pockets! ), and it gives a great silhouette – sort of boxy on top and almost like drawstring shorts on the bottom. 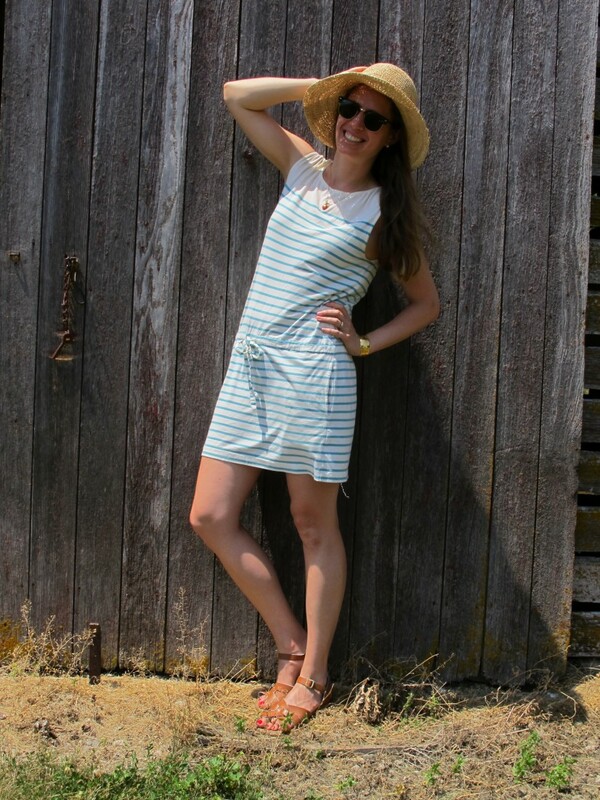 Paired with the straw hat and some sandals that got me through fields, barns, and water fights, it just exudes easy, summery chic. So many good memories from corn cribs like this and farm yards full of grasshoppers and monarch butterflies by day and studded with fireflies by night. You look great, Leah! I am happy you are enjoying your vacation, recalling pleasant past memories and making wonderful new ones. Thanks Jill! Vacations like these are treasures indeed.